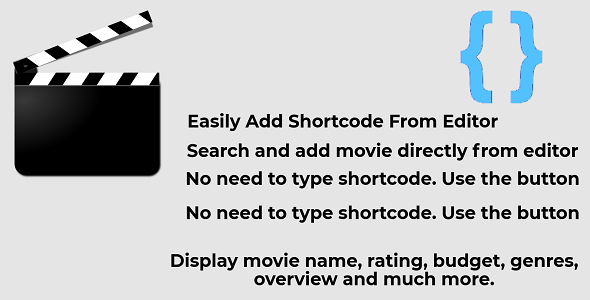 To work with IMDB Movie Shortcode WordPress Plugin, you need to get TMDB API key. You can get it by creating account on TMDB. Yes, with this plugin you can get movies from IMDB, but IMDB doesn’t provide any API key to get movie from them. But TMDB provides API key that can retrieve movies available on IMDB. It may look strange to many but actually TMDB is the API provider to get IMDB movies. After installing and activating this plugin, you will get the options settings page for this plugin under Settings > Movie Option. To add the IMDB movie info in your post and pages, click on IMDB Movie button in your editor page. Here you can put the IMDB ID of the movie, or you can also search the movie. Notice that, you have to provide the correct TMDB API key in the settings page to show the movie details on posts and pages through shortcode. Also, the movie search functionality during adding the movie from editor button use this API key. Put shortcode easily just by using the button in editor. Here you need to put only the IMDB ID of the movie or you can search to add the IMDB movie. There are 3 different designed theme available. Shows movie name, tagling, budget, rating, release date, overview and more. This plugin may be useful if you have an entertainment website or news blog on WordPress. You don’t have to type informations about movie. You can just add the movie by putting IMDB movie ID or by searching the movie from the editor button. To install this plugin, just go to plugin > Add New and then click on “Upload Plugin”. here you have to upload the “imdb_movie_shortcode_wordpress_plugin.zip” and then activate it.